Nothing beats the taste of homemade applesauce, and it’s so easy to make! Every year, starting in mid summer with the Gravensteins, and through late fall with Granny Smiths and Fuji apples, my father processes dozens of batches of applesauce from apples picked from his trees. He freezes them in large quart-sized mason jars for us to enjoy all year long. The secret to my dad’s applesauce is that he adds a couple strips of lemon peel to the apples while they are cooking, as well as some lemon juice or apple cider vinegar. The tartness of the lemon or vinegar serves to intensify the taste of the apples, and helps balance out the sweetness of the sauce. The result is a refreshing, utterly delicious applesauce. He also likes to mix other fruit in with the sauce. He’ll mix fresh cranberries in with the apples for cranberry applesauce, or stalks of rhubarb for rhubarb applesauce. Plums and pluots sometimes find their way into his applesauce too. Recipes and photos updated, first published 2014. Apples vary in their sweetness level, depending on the variety and how late in the season they are picked. The amount of sugar you will want to add will depend on how sweet your apples are, and how sweet you would like your applesauce to be. This recipe is just a guideline, please adjust the sugar amounts to your taste. You can even leave the sugar out all together if you are using sweet apples. If you use less sugar than this recipe suggest, you will likely want to reduce the amount of lemon juice as well. The lemon juice brightens the flavor of the apples and balances the sweetness. In place of the ground cinnamon you can cook the apples with a stick of cinnamon, just remove it before puréeing. *To prep the apples, use a sharp vegetable peeler or paring knife and cut away the outer peel. Then quarter the apple and use a paring knife to cut out the tough core parts from the quarters. 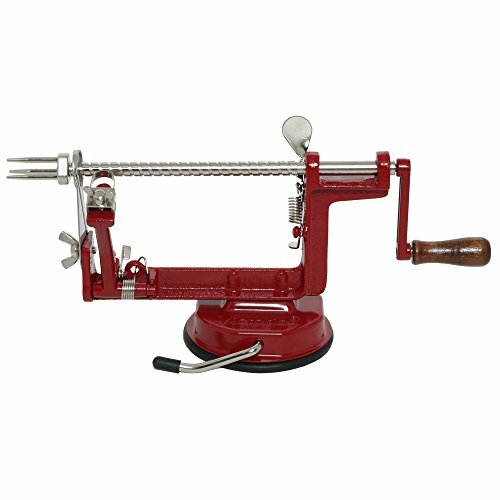 Or use an apple peeler corer. Bring to a boil on high heat, then lower the temperature, cover the pot, and maintain a low simmer for 15-20 minutes, until the apples are completely tender and cooked through. 2 Remove lemon peels, mash the cooked apples: Once the apples are cooked through, remove the pot from the heat. Remove the lemon peels. If the applesauce is too thick, add more water to thin it out. If not sweet enough, add more sugar to taste. If too sweet, add more lemon juice. This applesauce is delicious either hot or chilled. It pairs well with pork chops for savory dishes, it's terrific with cottage cheese as a snack or light lunch, and it's great with vanilla ice cream or yogurt. Freezes well and will last at least a year in a cold freezer. If you freeze it, make sure to allow enough headroom in your jar for expansion. At least an inch. Hello! All photos and content are copyright protected. Please do not use our photos without prior written permission. If you wish to republish this recipe, please rewrite the recipe in your own unique words and link back to Applesauce on Simply Recipes. Thank you! This was a gem of a recipe! My daughter and I really enjoyed making this together. The secret ingredient was the lemon juice and zest which added the right amount of tang to the sauce. We but the sugar to 1/3 cup and it was still sweet. Thanks a lot! I love this recipe! I’ve been using it for a few years now. It’s a family favorite. I use a 6-8 cinnamon sticks instead of powder. I usually make a double batch and freeze half. Thanks so much! I find that apples have enough sugar naturally so that there’s no need to add any. Also I wash ans scrub the apples but do no peel them. The skins are the best part of the applesauce. Can we add honey to the applesauce? Hi Emi, do you mean in place of the sugar, or in addition to the sugar? Honey has a very strong taste and can also turn dark brown when cooked, so I would tread carefully if swapping out some of the sugar with honey. And if we are adding banana puree to the applesauce how much can we add? Hi Emi, I think you’ll have to do that one to taste. I’ve never added banana puree to applesauce and don’t know what to tell you. Used only about a pound of apples and scaled everything down, maple syrup to sweeten, a pinch of nutmeg in addition to cinnamon, and skipped the salt. Put on top of a scoop of vanilla ice cream and crumbled Graham crackers on top. Lazy person’s apple pie – haha! Husband loved it. Great recipe. Very easy to make. Arkansas black apples which I never tried before or even heard of. (Sweet and tangy baking apple) and Winesap Apples. Delicious. Just made it for the first time. Absolutely love this recipe. Thanks for sharing. We eat applesauce with everything. I cannot even eat a pork chop without putting Apple sauce on it. I can’t wait to make pork chops now. I’m so glad you like it Terri! My brother’s Macintosh apples worked great. I also used coconut sugar in place of all the other sugars and it tastes marvelous. It did change the color. It is much darker and has a hearty,rich flavor. Thanks. Hi! I was wondering if you can substitute sugar with honey? Hi Artemis, honey has its own strong flavor, so using it instead of sugar would distract from the flavor of the apples. If you are trying to avoid sugar, some people just leave out the added sugar all together (if you do that you would want to scale back the vinegar or lemon juice). Not worth the effort. Cider/lemon juice and salt spoil good apple flavor. Took 40 minutes of simmering to soften nine apples. Dean is spot on – I’ve been making them exactly like that for years. Hello Elise I want to try this recipe. But can I freeze itt in freezer bowls? Hi, Beverly! Yes, you can definitely freeze this applesauce. It should keep well for about three months. Enjoy! I don’t know why people bother to cook the apples. I just core, chop, and blend them (granted, I have a vitamix) with some water and citrus juice, maybe some other fruit lying around or a spoonful of jam, et voila. Shake a little cinnamon over it. Can I use Honey crisp apples for this recipe? Hi Christine, they should be great! The absolute best applesauce I’ve ever had! Mmm! Made this and it was delish, thank you for sharing the recipe. I’ve made a variation of this applesauce. I keep the peels on for the fibre, you just need an immersion blender to purée. Also, no need whatsoever to add sugar..apples are sweet enough! Blown away by how delicious and perfect this is. I used a mix of gravenstein and golden delicious from a local orchard. Any idea how long this will last in the fridge? What I didn’t eat on the spot I packed into two sterilized weck jars. Thanks for the guidance. We have a bumper crop from the backyard Apple tree. I’ll be making this Apple sauce daily for a while! Turned out great and the kids love it.